Celebrated landscape architect Jean Mus designs gardens that reflect his extraordinary abilities as both an artist and a horticulturalist. Mus's lavish installations display a rich spectrum of Mediterranean influences, incorporating pottery, slate walkways, sleek water channels, and Mediterranean flora. 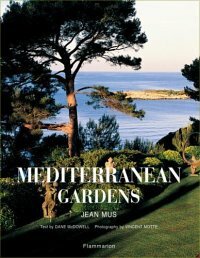 In Mediterranean Gardens, Mus invites the reader to explore twenty of the exclusive gardens that have made him famous. Dane McDowell guides us across the artist's verdant landscapes throughout southern France and into Greece and Portugal. She divulges the stories behind Mus's gardens and peppers the text with technical and reflective anecdotes from the designer himself. The sublime photographs of Vincent Motte provide inspiration to gardeners, Mediterranean buffs, and landscape designers alike. Landscape architect Jean Mus has integrated the teachings of Ferdinand Bac and Russell Page into his own philosophy and career. With his passion for Provence, he has created the most beautiful gardens in the south of France. Dane McDowell, journalist and academic, is the editor in chief of the magazine Résidence Décoration. She contributes regularly to the Figaro Magazine and Connaissance des arts, and is the author of Living in Provence. Vincent Motte, photographer, lived in Provence for more than twenty years. His wonderful gardening photographs illustrate several books including Gardens in Provence and Gardens of the French Riviera . Would you like to contribute content to this site?